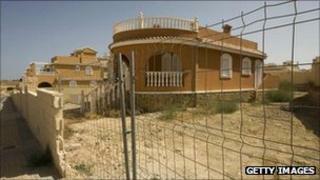 Spain has announced plans to try to tackle the severe problems facing its housing market. The government will temporarily halve the sales tax on new homes to 4% to try to stimulate its construction sector. The sales tax cut is one of a number of measures that was agreed at a cabinet meeting. The measures are designed to boost Spain's weak economic growth rate and generate revenue to help it cut its deficit. The reduction in tax, designed to stimulate the construction sector, would last until the end of the year, a government spokesman said. "This is a temporary and exceptional measure," he added. There are also new measures to bring forward corporate tax payments and cut health spending on brand-name drugs. It is hoped the move to cut drug costs for regional government via the introduction of a new generic medicines bill will save 2.4bn euros. A further 2.5bn euros could be raised by front-loading tax payments from large businesses until 2013. The government said the various measures would make it easier to hit deficit targets this year. Economy Minister Elena Salgado also said that, next Friday, Spain would approve measures to stimulate jobs. "We are going to carry on taking measures to stimulate and favour growth, which will strengthen those we already have in place, in the labour market," she said.